Unite members under the Offshore Contractors Association (OCA) agreement today (Wednesday 29 July) rejected proposals over changes to shift rotas and terms and conditions following a consultative ballot, increasing the likelihood of industrial action in the North Sea. 63.5 per cent per cent of members balloted voted against OCA’s offer to move to a three-on / three-off shift pattern, with a variable remuneration offer to mitigate the impact on terms and conditions caused by the changes to working-time arrangements. Unite industrial officer Willie Wallace said: “We said previously that our members would have the final say and they are clear that the OCA offer isn’t good enough. “North Sea employers must do more to address the deep concerns our members have over these shift pattern changes – from loss of earnings and livelihoods to the impact on workplace health and safety and quality of life. “We are not blind to the challenges facing the industry, indeed we are acutely aware it because the human cost of the downturn is clear in the deep cuts to our members’ incomes and livelihoods. 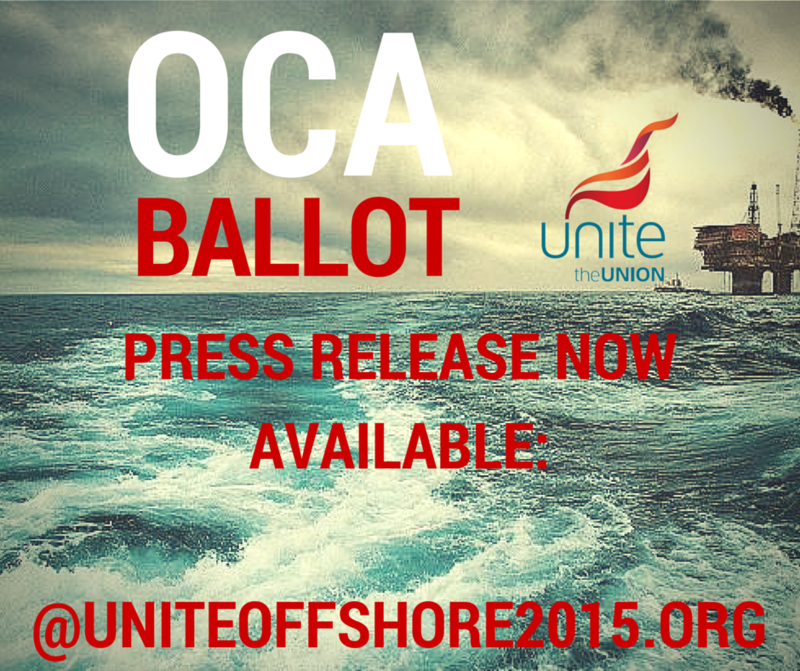 Unite Members in the OCA have rejected the latest offer put forward by the Offshore Contractors Association. The ballot closed at 12 noon today. More information to follow in the next few hours. The ballot for the OCA closed at 12 noon today. Please follow us on social media for updates. This is a reminder to all UKDCA Unite members. As you may be aware your union is balloting its members following the disappointing response to your union’s pay claim. All members should have received a ballot paper and a covering letter explaining the situation. The ballot closes on THIS FRIDAY 31 July at 12 noon. If you haven’t received a ballot paper yet, then please urgently contact the Unite Aberdeen Office on 01224 645 271. PLEASE RETURN YOUR BALLOT ASAP. The irony of union busting is that management is extremely fearful of “losing control” of the workplace and sharing power and money with its workforce in the form of a trade union. 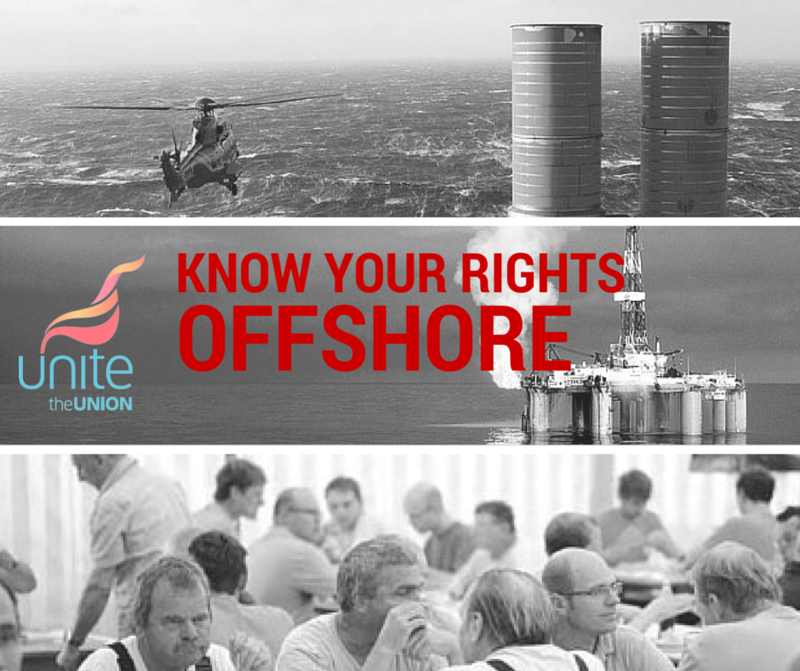 Unite busts the myths on the offshore campaign. Please see below. COTA have told us that they will not reinstate the second part of your negotiated two year pay deal. Despite our good intentions to resolve this dispute, COTA have made it clear that they are not prepared to re-enter negotiations. We will shortly be serving formal notice on each of the COTA employers of an industrial action ballot, we are awaiting approval from the legal department to ensure we are not open to legal challenge. This is nothing short of insulting to hard working members, who play a vital role in maintaining operations in the North Sea. Please continue to check our facebook and website for updates. The consultative ballot for UKDCA Unite members must be returned by noon on Friday 31st July 2015. If you have not received a copy of the UKDCA response and a Unite consultative ballot paper, then please immediately contact the Aberdeen Office on 01224 645271. The UKDCA response to your union’s Pay and Conditions claim is very disappointing. Despite the fact that the Oil and Gas industry continues to be very profitable in the UK, there appears to be widespread redundancies in response to the downturn. Clearly this is not an appropriate response for those of us who want a sustainable future for the North Sea. If you have not received a copy of the UKDCA response to our Pay and Conditions claim or a Unite consultative ballot paper, then please immediately contact the Aberdeen Office on 01224 645271. Know the truth about your rights offshore. Companies will often employ union busters during ballot or campaigning periods. So we’d like to remind all our members offshore of their statutory trade union rights. Through our mass-consultation with members, we’ve been alerted that some offshore companies are telling Unite members that trade unions are banned. This is categorically untrue. Unite are one of the recognised trade unions in the North Sea. We’ve also had reports of some managers asking workers if they are members of a trade union. You are under no compulsion to tell them the answer, although there is no law stating that they cannot ask. Unite has a proud record of defending those who suffer victimisation for being union members. We always make it clear to all employers that Unite will not tolerate victimisation of our members and we will respond robustly to any further intimidations of Unite members. If you witness or are the victim of discrimination for being a Unite member please get in touch with us by emailing offshoreunite@gmail.com and one of our organisers will arrange to contact you.